What’s the style of the house? I guess you would call it a Cape Cod since it is technically one-and-a-half stories. We looked at hundreds of plans and combined what we liked. Can you describe the floorplan? Our house has three bedrooms with an extremely open floorplan. 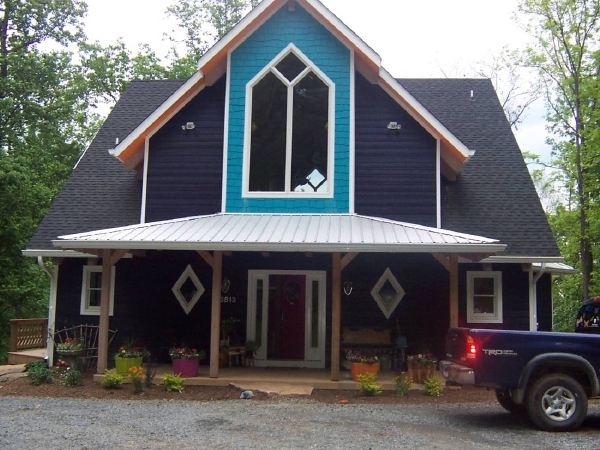 The entire second floor is the master suite with 20-foot cathedral ceilings of heavy timber. The main floor consists of the open kitchen, pantry, dining area, powder room, and living area. We like to have parties and this open floorplan lends itself to entertaining—everyone can be in the same room, but also spread out. We also have a large wraparound deck. The basement has a large laundry room (which also holds an extra fridge and freezer), an exercise area, a full bath, two bedrooms, and a recreation room with a wet bar. When did you move in? We started building the house in the fall of 2003 and moved in in August 2004. We did as much work ourselves as we could to save money. It took us a bit longer than if we had had a builder build it turnkey. What look did you set out to create? My husband and I love the Caribbean, and we wanted to bring as much of that into the house as we could. We also wanted a rustic feel, to fit the rural mountains surrounding us. Inspiration? I’ve looked at lots of magazines throughout the years—Washingtonian, Better Homes and Gardens—and I used to watch Trading Spaces for crazy ideas. We also like driving through old rural towns for ideas on colors. I kept an idea book and just winged it. There are seven different colors on the first floor alone. We painted the first coat at ten o’clock at night, and there were only naked bulbs hanging from the ceilings. I cried, thinking I’d just spent $3,000 on paint and it looked awful. My friend drove out and reassured me that it would be fine, so I kept on painting. The next morning in the sunlight I just smiled—it looked great! Biggest decorating challenge? I’d say my biggest challenge is finding a place for everything I had in storage. The two bedrooms in the basement are full of neat pieces that I haven’t got a suitable place for in the house. Favorite part of the house? I love the main floor because although it’s open, it’s also cozy. The heavy timber beams give it a really warm feeling. I love the colors. I also love my kitchen—it has really good flow and lots of counter space. The cathedral ceilings in the master suite always awe people, and the rustic set of spiral stairs are a great focal point when you walk into the house. You can see all the way to the basement from the second floor. Least favorite? As much as I like the tile in the master bath, we’ve had issues with it popping up, so that’s irritating. Proudest do-it-yourself achievement? I painted the whole house myself and I laid the tile in the kitchen and around the fireplace. My husband helped, but he was very busy doing the carpentry work—he built built-in cabinets throughout the house. We had our hands in every process of building this home. It was exhausting and stressful, but we can proudly say now that we built our home ourselves (with the help of my father’s company, Ronald M. Hawes Inc., of course). Advice? Find a good builder. Realize that during the process you are going to be stressed out, you never think it’s going to get done, and you will get really grumpy. Be brave, try new colors—you can always repaint it if you don’t like it—and wait and look at it in the daylight. It always looks better with natural light and furniture. Do you have an interesting house or apartment? Want it featured on House Tour? Email mfleury@washingtonian.com. For more House Tours, click here.